So have you ever walked into a beach rental and been disappointed with the decor? I can assertively raise my hand. Why is it a common theme to use dark leather and microfiber in all the places we have rented? Nothing about those two materials speaks costal inspired to me. I guess I can understand why they would use these materials for the couches and chairs, however, I am always a bit perplexed as to why they choose the color scheme they do. Most of the costal rental properties that I have been in have a color palette of dark reds, or burgundy, with yellow, fake greenery, even sometimes animal prints or dated plaids. I am sure there are lots of gorgeous decorated homes near the coast, I've seen them photographed in Costal Living Magazine, we just haven't rented one yet. 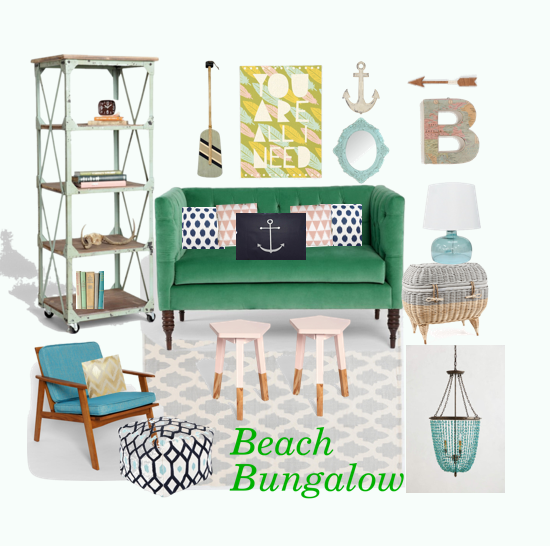 So I decided to write a fun little series called "Designing a Beach Bungalow." I am going to pretend that my family and I just purchased a cute little cottage by the ocean, and I get to decorate and furnish it. A girl can dream, right?!? 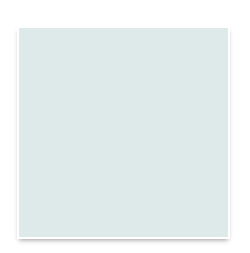 Birds Egg By Benjamin Moore I think I would half strength this one if I decided to use it. Now the room is painted, so here is the design board I came up with for the space. It's my version of a modern yet vintage feeling beach inspired room. 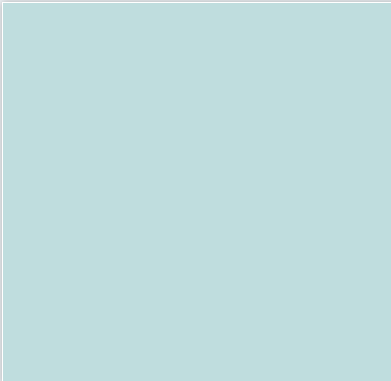 The color pallet I went with is aqua, turquoise, navy, pale pink, and a splash of kelly green. These all seem like more suitable colors for the beach, right? 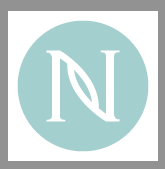 The blues and aqua remind me of the ocean and sky, the green, for the tall green palm trees, or the bermuda grass which is more prevalent down south, and the pale pink, because that is the color the sky gets at night during a gorgeous sunset. This room makes me happy, it feels fresh, and I think it's a fun option for a beach house. I also love how the room looks eclectic and collected. 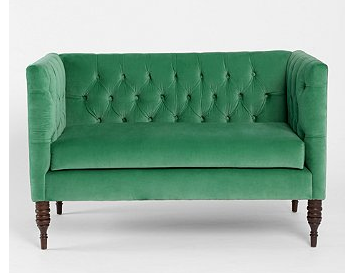 Nothing is too matchy, and it looks comfortable and livable. 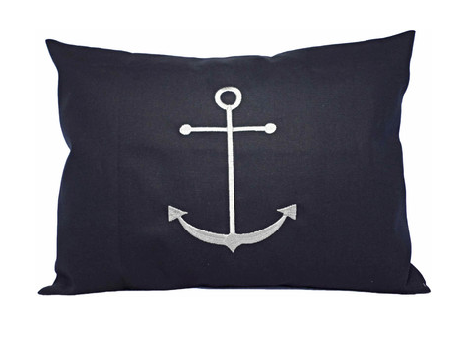 I found most of all these items online, so it would be super easy to have them shipped to your beach cottage. And I think everything is reasonably priced. Here is a list of the items and where you can get them. Now for some pillows. I found a really good selection of pillows from Etsy. There are a lot of great shops on there and an awesome selection. And of course you could make them yourself. The modern chair I also found at Urban Outfitters. I like the little hint of modern in the room, and think that the pop of turquoise is perfect. 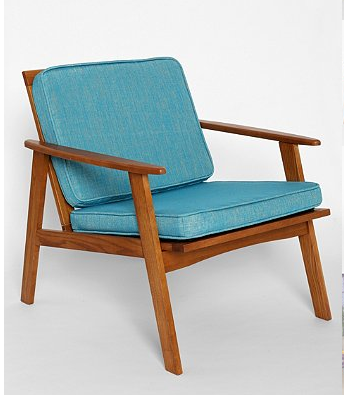 It kind of reminds me of an outdoor chair, which I think is wonderful for a beach home. 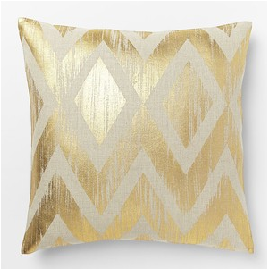 The gold metallic pillow can be found at West Elm. It's a fun little ray of sunshine in the room. 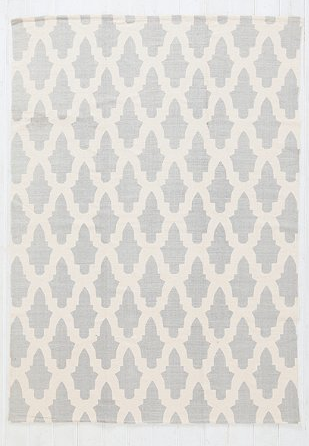 The rug is from Urban Outfitters, and I like having the gray subtle pattern to ground the room. 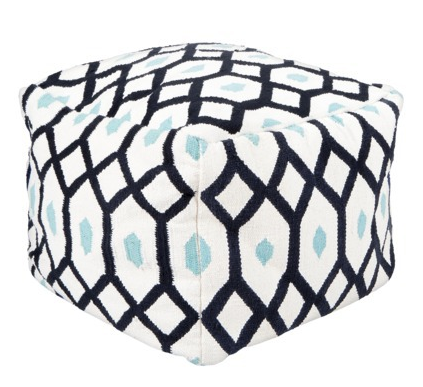 If you have been to Target over the past two months then I am sure you have seen these lovely poufs. I have purchased one myself, but have to resist the temptation to purchase more every time I am there. I really just love them, and the colors that they come in. 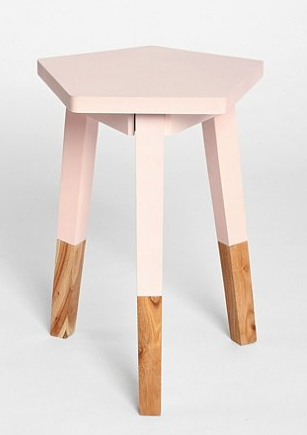 These little pink stools are also from Urban Outfitters, but I think you could emulate the same design if you wanted by finding some thrifted tables and painting them. Leave the bottom legs exposed wood, or you could paint the bottom tips gold, how fun would that be? And I think they are great for additional seating. 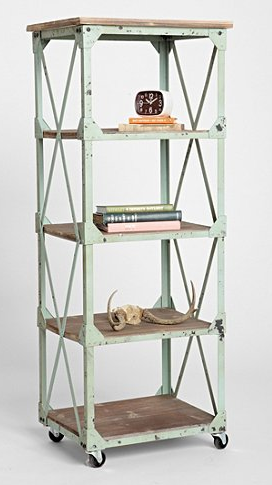 The tall rolling bookcases are also from Urban Outfitters, and I think you could easily put two of these in the room. I love that they are on rollers so that you can easily move them around in the room. You could put a small TV on one of the shelves too. 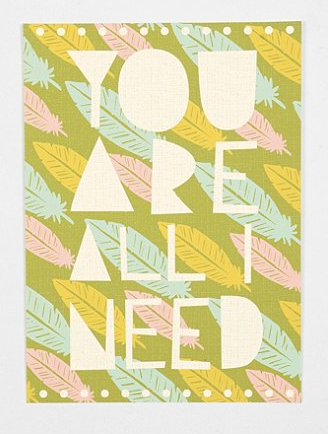 I love this print from Urban Outfitters, because when you go to the beach with loved ones or friends, all you really need is each other to have an amazing time. When I am down at the beach all I need is my family, the ocean, and the beautiful sunshine. 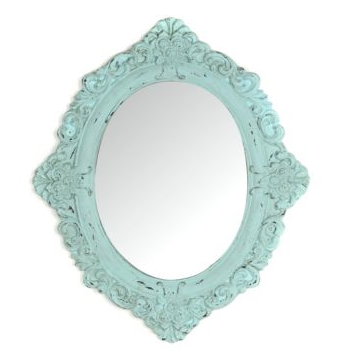 This sweet little mirror is from Kirklands. 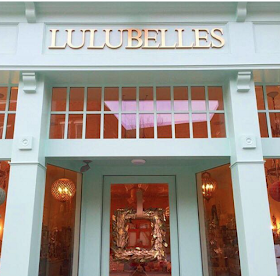 We have one of these stores near us, and I can go in from time to time and find some great accessories. 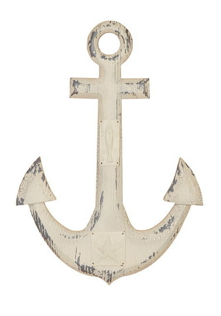 I have seen similar wooden anchors at Homegoods, I am sure it would not be that hard to find, especially if you are shopping near a coastal community. 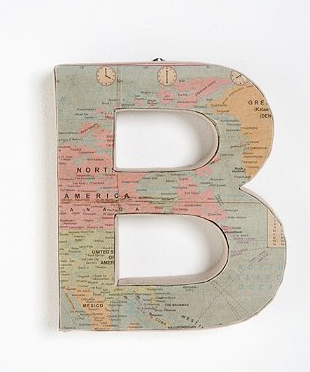 The B and the arrow can be found at Urban Outfitters. I chose the "B" because our last name begins with a B, but B also stands for beach, so I thought it was fitting. 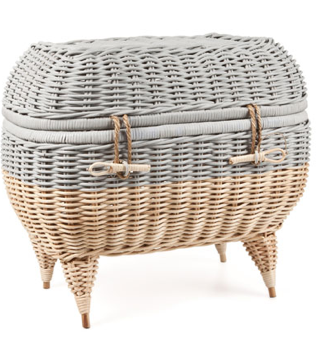 The sweet little wicker side table trunk came from Zarahome.com Who knew that Zara had a home store? Good to know, since I love their clothing store. 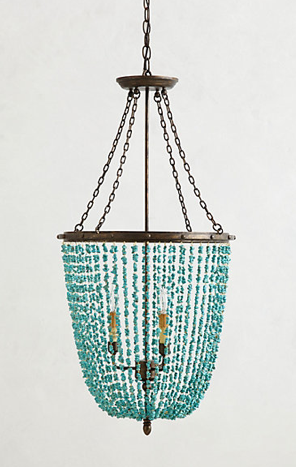 Last but not least, one of my favorite elements in the room, the aqua glass beaded chandelier. 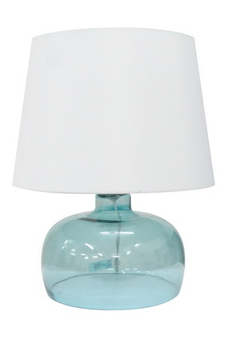 I found this one at Anthropologie, but I know for a fact that other lighting companies carry this light, or one similar. So shop around and find the perfect one for you. I would scatter vintage books, and seashells though out the room too. Sand dollars are my favorite. So there you have it, my vision of what our perfect little beach cottage family room may look like. 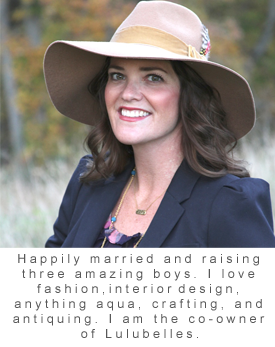 I hope that you feel inspired to add a few little costal accents in your home, especially since summer is just around the corner. Looking forward to part two in the series, which will be a guest room design.